When you think of landscape lighting, you might tend to think of just a few randomly placed outdoor lights scattered throughout a property. But in fact, an installer of landscape lights is an artist of sorts, using a palette of light and shadow to create an artistic nightscape. Spotlights are placed on the ground and aimed upwards, highlighting the best or most impressive features of an object, such as the canopy of a tree, for example. Sometimes multiple lights are focused upon a single large object. Spotlights are focused downward upon an object or landscape feature. Lights are commonly attached to trees, rooflines or garden walls. The focus of the light can be adjusted to achieve the desired radius of illumination. Landscape features are highlighted with lights focused from 2 or more directions. A spread light is placed between a plant (or an object such as a fountain or statue) and a wall or fence. This silhouettes the object against a background of soft white light. A light is placed behind a feature such as a uniquely-shaped plant, and aimed towards a wall or fence. This casts the shadow of the object against a background of light. Lights mounted high in the canopies of trees, and aimed downwards, creates the hauntingly beautiful effect of a full-moon shadowscape. Lights are used to highlight and focus attention upon specific features or objects. The lights may be aimed upwards or downwards, and the beam widened or narrowed for dramatic effect. Your Landscape is a Work of Art. Shouldn’t Your Nightscape Be, Too? You’ve invested lots of sweat and money into your landscape. The result is that your landscape is a work of art by day. It’s a shame, then, for all of that beauty to lie hidden from dusk to dawn. 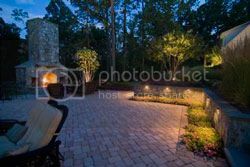 Let a landscape lighting installation professional employ his tricks-of-the-trade in highlighting the beauty of your landscape by night. Then you’ll be able to enjoy the fruits of your landscape labors 24-7. This entry was posted on Friday, May 3rd, 2013	at 2:56 am	. You can follow any responses to this entry through the RSS 2.0	feed. Both comments and pings are currently closed.